JACKSONVILLE, FL--(Marketwire - January 28, 2011) - Enjoy the car show... without a car! That's right it's easy to personalize this year's trip to The Amelia Island 2011 Concours d'Elegance on March 11th through 13th with a Jacksonville Airport hotel package that includes transportation to and from the event, complimentary breakfast and free shuttle service to area shopping and restaurants. Bobby Rahl, three-time Championship Auto Racing Teams (CART) champion and 1986 Indy 500 winner will be headlining the event as honorary chairman and promoters promise a wide selection of his cars as a show feature. As one of racing's biggest stars, Rahl's impact on racing includes F1, Can-Am, Le Mans/IMSA endurance racing and open wheel, as well as his experience as a successful team owner and past president and CEO of CART. Held annually at The Ritz Carlton and The Golf Club of Amelia Island at Summer Beach "The Amelia" is a charity event recognized globally as an elite car show featuring rare vehicles from around the world. In celebration of its 16th anniversary, this year's show will focus on the Duesenberg, Allard and Kurtis automobiles. The famous "Mormon Meteor" Duesenberg will make its first appearance since undergoing a major restoration two years ago. Show attendees taking advantage of the Fairfield Inn & Suites' Airport hotel package in Jacksonville can relax and enjoy this prestigious show along with upscale amenities, while leaving the hassle of transportation to hotel staff. Offering unsurpassed service, the hotel is located just 19 miles from the Ritz Carlton Amelia Island, just a short 25-minute drive up the Interstate. With accommodations sometimes difficult to secure, this unique package starts with rates for a standard king room at just $175 and includes roundtrip transportation to the Concours d'Elegance for two, complimentary deluxe continental breakfast with hearty and healthy options, a $5 credit at the hotel's Marketplace, free transportation to River City Marketplace for shopping and movies, free transportation to area restaurants including Chili's Olive Garden, Buffalo Wild Wings and more, complimentary Wi-Fi, local calls and full access to the hotel's onsite fitness center and heated outdoor pool. Those planning a trip in March to the Concours d'Elegance may check room availability online at www.marriott.com/jaxap or call 1-904-741-3500 for reservations and additional information. The car show schedule and ticketing information are available at http://www.ameliaconcours.org/. 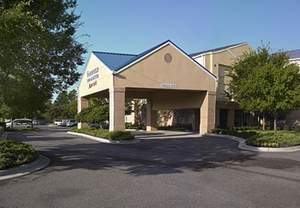 Conveniently located near Jacksonville International Airport (JAX) the Fairfield Inn & Suites Jacksonville Airport hotel provides 24-hour airport shuttle service and is easily recognized as a distinctive choice among hotels near Jacksonville Zoo and other popular attractions, providing guests with a variety of spacious and upscale accommodations to meet their travel needs. Luxurious bedding ensembles and bath amenities are standard in each guest room, as are flat screen televisions with satellite/cable service and premium movie channels. The Fairfield Inn & Suites Jacksonville Airport Hotel provides guests with a home-like atmosphere and remarkable service and amenities that make travel to North Florida comfortable and memorable. In addition to being conveniently located among hotels near Jaxport Cruise terminal, the hotel provides business travelers with easy access in and out of the area, well-equipped business accommodations, Jacksonville Airport meeting rooms and complimentary on-site parking. We are conveniently located off I-95 exit 363 near the Jacksonville International Airport, River City Marketplace, Blount Island / Cruise Port Terminal, Garden Mountain and several free standing restaurants.